What is the Roth IRA early withdrawal deadline? Is there a specific date on the annual calendar that you need to be aware of? While there's not a specific date you need to circle on your calendar, you do need to be aware of two effective deadlines for early withdrawals. In fact, they are the very criteria which determine whether or not a distribution is an "early withdrawal." When it comes to meeting the Roth IRA early withdrawal deadline, the rules don't get more simple than this. You must be age 59 ½ or older. So what does the ½ in 59 ½ mean? According to IRS Publication 590, this date is "six calendar months after your 59th birthday." So, as an example, if you were born on January 15, 1960, you turn 59 ½ on July 15, 2019. So why is age 59 ½ designated as "the Roth IRA early withdrawal deadline"? And why is it so important? Well early withdrawals are generally subject to income taxes and a 10% early withdrawal penalty. And if you make a withdrawal prior to age 59 ½, you're technically making an early withdrawal. Now, that said, not all early withdrawals are associated with income tax bills and early withdrawal penalties. You can always withdraw your original annual contribution funds tax-free and penalty-free at any time for any reason, no questions asked. But the other funds in your account - investment gains, rollover funds, conversions, etc. - those aren't necessarily tax and penalty free if you withdraw them prior to age 59 ½. For example, let's say you're 58 years old and you have $50,000 in your Roth IRA - $25,000 in annual contributions you made and $25,000 in investment gains. If you withdraw all the funds in your account, the first $25,000 is tax-free and penalty-free, because you're simply withdrawing the after-tax dollars you originally contributed. But the $25,000 in investment gains are subject to income taxes and a 10% early withdrawal penalty because you're under age 59 ½. What if we take the same scenario and assume you're age 60? Does that mean you can withdraw the $25,000 in investment gains tax-free and penalty-free? Not necessarily. In addition to reaching age 59 ½, you have to meet one other condition as well. The second Roth IRA early withdrawal deadline you need to remember is the 5 year rule. The five year rule states that you must open and fund your Roth IRA for at least five tax years before you can withdraw investment gains, rollover funds, or conversion funds tax-free and penalty-free. Let's say in July 2014 at age 63 you open and fund your Roth IRA. When will your account meet the requirements of the 5 year rule? Remember, it must be open and funded for at least five tax years, not calendar years. If you said January 2, 2019, you're absolutely correct! Well, the five year clock begins ticking with the tax year in which you first open and fund your account - in this case, 2014. 2018 is the 5th and final tax year your account must be open and funded. After that, you've met the 5 year rule requirements. And since most financial institutions are closed on January 1st, that makes January 2, 2019 the first day on which your account meets the requirements of the 5 year rule. So does that mean you're home free? Once you reach age 59 ½ AND your account meets the requirements of the 5 year rule, then you're free to withdraw any funds from your account without having to worry about taxes or penalties. 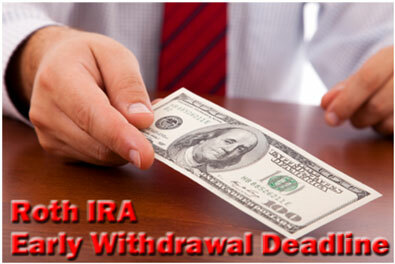 At that point, you don't have to worry about any sort of Roth IRA early withdrawal deadline. What about the Roth IRA early withdrawal deadline in regard to filing taxes? What's the deadline for making an early withdrawal for any given tax year. While you can make an early withdrawal at any time, any early withdrawal will be treated as taxable income by the IRS for the calendar year in which you make the withdrawal. So an early withdrawal on December 31, 2014 will add to your taxable income for the 2014 tax year, while the same early withdrawal on January 2, 2015 will add to your taxable income for the 2015 tax year. You may ask... What's the difference? Depending on the circumstances, it can make a big difference. Since early withdrawals are added to your taxable income, a substantial withdrawal could bump you into a higher tax bracket. With this in mind, it's important to understand how an early Roth IRA withdrawal will impact your tax liability. There's is no official Roth IRA "early withdrawal deadline," but there is an effective early withdrawal deadline. Any withdrawals from your Roth IRA prior to meeting these two conditions are considered early withdrawals. And aside from withdrawing your original annual contributions, these early withdrawals are most likely subject to income taxes and a 10% early withdrawal penalty.